Much news has recently been written about how improved technology has led to rising U.S. oil and gas production, and whether the U.S. will become energy independent in the future. Since at least 2003, Utah has been a part of this increasing oil and gas production pattern. 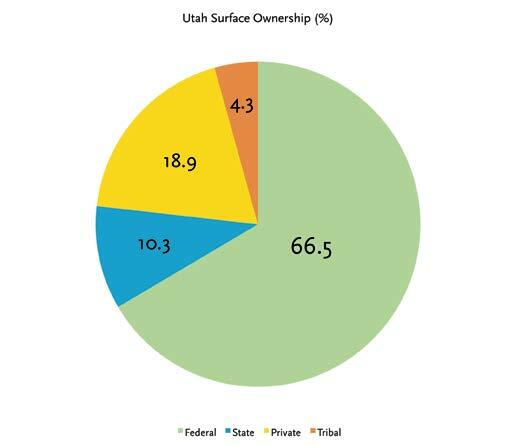 In Utah, ownership of the land with petroleum potential is divided into four major categories: federal, state, tribal, and private. According to a February 2012 Congressional Research Service report, about two-thirds of the state’s surface area is owned by the federal government. The remaining third is split between private, state, and tribal ownership. 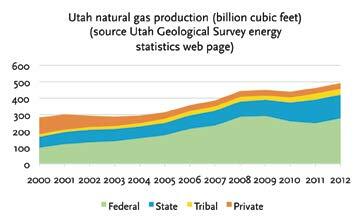 Utah Geological Survey (UGS) fossil fuel production records for the period from 2000 to 2012 show that while annual gas and oil production was mostly increasing overall since 2001, production by various owners showed some differing trends. Interestingly, production of natural gas from federal lands grew in absolute and relative terms until 2009, when the percentage produced from federal lands was about 66 percent, or approximately proportional to the percentage of federal land ownership in Utah. Since 2009, gas production from federal lands has generally declined or been flat. 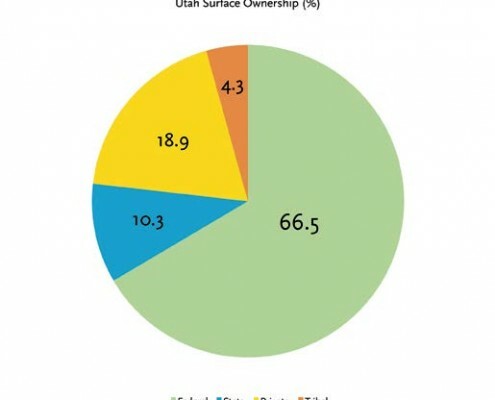 In 2012, only 47 percent of Utah’s gas production was from federal lands, indicating gas production from federal lands is no longer proportional to the percentage of federal land ownership. For oil production, all ownership categories generally followed an overall decreasing production trend from 2000 to 2003, and then had increases through 2012. However, only federal oil production recorded recent drops in both 2010 and 2011 of about 5 percent each year, but rebounded slightly in 2012. 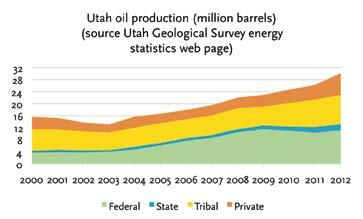 Total Utah oil production has historically been strongly influenced by tribal areas since Utah’s largest fields, Greater Aneth and Altamont-Bluebell, which combined have produced about half of the state’s oil, are found mainly on Navajo and Ute tribal lands, respectively. Whether the amount of oil produced by Utah’s various land owners will ever be proportional with the amount of land held by these owners is unclear, but recently the percentage of oil produced from federal lands has dropped, from a high of 50 percent in 2009 down to 37 percent in 2012. What is the significance of these production trends by ownership? Since the federal government controls about two-thirds of Utah, if petroleum production from federal lands continued to drop, Utah’s overall petroleum production would eventually be pulled back into a declining trend. Increased oil and gas development on the non-federal one-third of Utah alone cannot sustain long-term high levels of statewide production when federal lands are not also participating in a similar increasing trend. Thus, if Utah’s federal lands do not renew absolute and proportional increases in petroleum production, over the long term jobs and revenues from Utah petroleum production should decrease.